So I'm back on my Regency fad again (something similar happened this time last year, too!) where I dwell in a quieter, polite but more restrained society. For anyone who has stuck with my reviews, they've probably sussed that I am a bit of an Austen fan and my two absolute favourites are Pride and Prejudice and Persuasion. I read Darcy's Diary by the same author last year and thought it was "okay" and gave it three stars. I think this one works better for a couple of reasons, but my grumbles are the same as before. So, let's get the grumbling over...and apologies for repeating myself. It's written in diary form, but there is a vast amount of direct speech used throughout, particularly in the latter half. A lot of this is lifted straight from the original, and lets face it, if you're reading this you'll probably be pretty familiar with the original text anyway. No-one writes a diary using direct speech, so maybe it needs a different style. 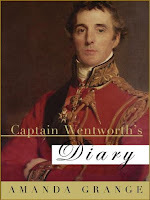 However, despite the above rant, it was less jarring that the Darcy Diary and I got over it! Now, the good and there's a lot I liked! I think the booked worked because Captain Wentworth is a more straightforward character. I'll be accused of over simplifying, but it's a case of he loved Anne wanted to marry her, was turned down after an initial acceptance, was extremely hurt, went on with his career but never got over her. There's less "internal agony" in this hero than Darcy and he's also less precious in terms of not being every woman's ideal (although the image of Rupert Penry-Jones is a very good image to have in mind!!). Yes, the diary shows him in turmoil as he gradually realises that he really never got over Anne and doesn't know whether she feels the same and the situation that leads to him writing the "You pierce my soul" letter (which is one of my favourite sections of Austen) is done very well. I praise Grange in that she doesn't try to make him too modern in analysing his feelings both for Louisa and for Anne. 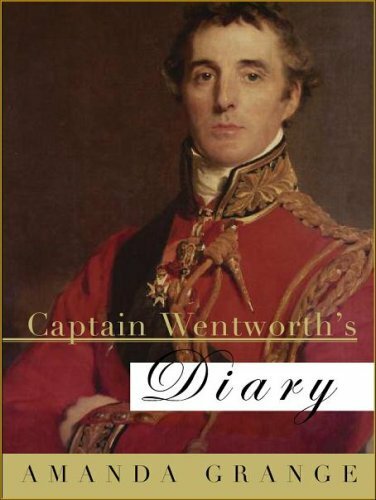 Wentworth comes across as a bit of a flirt in his early days, with maybe an over inflated sense of Pride, but a generally likable, solid man who is honourable and loyal to his friends and family. He grows over time in stature and wisdom, and this is beliveable but at times it felt a bit superficial. I enjoyed the first section of the book which covered how Wentworth and Anne met and their developing romance. Wentworth isn't looking for anything other than pretty girls to flirt with and although Anne is overshadowed by her proud father and sister she comes across as clever and engaging, which is good to see as she later becomes more passive and this gives a glimpse of what is so special about her that draws Wentworth back after eight years. Overall, it's one for Austen fans, a good knowledge of the original makes it a much more enjoyable read and thankfully it doesn't alter the original characterisations and situations. The general style and language doesn't jar too much and I spent a really pleasant afternoon reading it. Where did the last 4 months go?! !